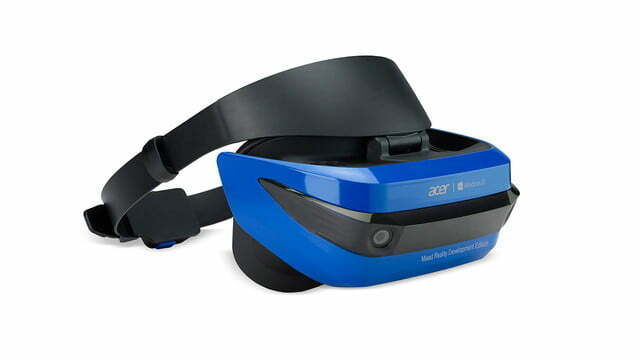 Acer’s Windows Mixed Reality headset is the future of VR on Windows, and it looks bright. When Acer unveiled its Windows Mixed Reality headset back in early 2016, it was a little light on the details. It didn’t say how much it would cost, or how it would measure up to competition like Facebook’s Oculus and and HTC’s Vive. And it was mum on the release date. Acer pulled back the curtain a tad at its annual press conference in New York City on Thursday. It didn’t reveal everything about its Windows Mixed Reality headset, but it offered Digital Trends an opportunity to try it ourselves. Here’s what we thought. 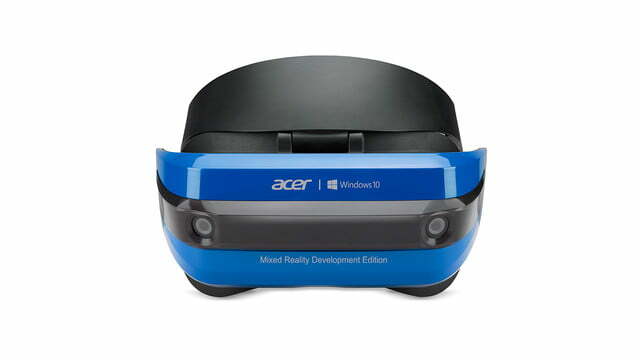 Acer’s Mixed Reality headset is based on Microsoft’s Windows Mixed Reality platform, which made a public debut with the release of the Windows 10 Creators update earlier this year. HP, Asus, Acer, Dell, and other partners are collaborating with Microsoft on headsets with inside-out tracking — basically, three-dimensional spatial awareness. Thanks to infrared sensors, gyroscopes, and accelerometers embedded in the headsets themselves, they’re able to maintain constant awareness of the physical environment around them. It’s like the Vive or Oculus’ room-scale tracking, but without the need for external cameras. That makes setup a lot easier, and reduces the price. Acer’s take on the concept doesn’t stray far from its VR forebears. It has two high-resolution LCD displays (for a total resolution of 1,440 x 1,440), capable of a 90Hz refresh rate — a slightly higher resolution than the Vive and Oculus, which both pack 1080p panels. A built-in audio jack pipes sound through a pair of headphones, and a 3.5mm jack supports mics. The screens seemed bright, crisp, and clear to my eyes, and the headset’s inside-out tracking worked without a hitch. Like the Oculus and Vive, Acer’s Windows Mixed Reality headset is tethered. Unlike Microsoft’s HoloLens, which packs a sophisticated computer that drives its augmented reality technology, Acer’s headset relies on a UBS 3.0 connection, an HDMI cord, and a powerful gaming computer to do the VR heavy lifting. For our demo, it was a beefy gaming laptop from Acer’s Predator lineup. 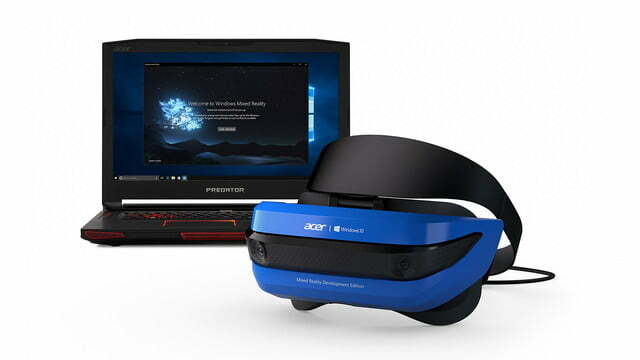 When you plug Acer’s headset into a Windows 10 machine for the first time, you’ll see the Mixed Reality Portal app, a management screen that guides you through the basics of calibration. It asked for my height, and then asked me to face the Predator laptop at eye level. The last step was defining the constraints of my “play space,” the physical area that’d be reflected in the virtual reality apps I was to try. An Acer rep helped me fit the headset, which felt far lighter than the Oculus, Vive, or even Samsung’s Gear VR. Its weight made the headset seem hollow, and the adjustable strap pinched the back of my head a little too tightly. But the screens seemed bright, crisp, and clear to my eyes, and the headset’s inside-out tracking worked without a hitch. An Acer rep launched Mixed Reality Home, a digital domicile replete with wood-paneled floors, two-toned coffee tablets, and a wide-open floor plan (gaps between the walls and ceiling expose your virtual reality avatar to the elements). It was split into familiar subsections like an entertainment space, a living room, and an office, but instead of televisions, artwork, and computer monitors, I encountered floating Windows apps. It’s a visual metaphor for Windows, akin to Microsoft’s ill-fated Bob experiment. Instead of a mouse and keyboard, though, exploring the Mixed Reality Home requires an Xbox Controller. The joysticks and bumper triggers handled forward and backward movement, and alternatively, you can “teleport” around the house by gazing in the direction you want to travel and pressing a button on the controller. The Xbox controller was used to interact with apps in the Mixed Reality Home, too – I could scroll a webpage on Edge, Windows 10’s default web browser, with a joystick, or zoom in by double-tapping the A button. Outside the floating Edge window, the same two controls resized it, minimized it, rotated, or removed it from the virtual home entirely. Tapping the controller’s Home button brought up Mixed Reality’s system controls, which consist of status indicators for the connected PC’s Wi-Fi status, battery level, volume level. There’s the current time, too, and a list of recent apps. The Acer rep directed me in the virtual home’s living room. There, a massive TV-like screen greeted me. I selected a 360-degree video from a gallery of options, and the digital home slowly faded from view, replaced with peaks and cliff faces of a snow mountain retreat. I watched transfixed through a downhill skier’s helmet-mounted camera, turning my head backwards as the videographer traversed the slope. The Mixed Reality headset can play 360-degree footage from any headset, an Acer rep told me, including content from the company’s new Holo 360 camera. Conventional two-dimensional footage is a go, too, but only within the Mixed Reality Home app — it shows as a giant, expandable screen in the “living room” environment. Acer’s headset supports apps, too. HoloTours, a curated collection of exotic real-world locations, transported me inside an open-air gondola perched precariously over a hilly valley. What it doesn’t support, despite the name, is true mixed reality. The Acer headset works just like a Rift or Vive, displaying images on LCDs placed close to the user’s eyes. The LCDs are opaque, so the outside world isn’t visible. That means the experience is not like HoloLens, or even like Intel’s Project Alloy, which doesn’t have transparent display technology but does allow visibility of, and controller-free interaction with, real-world objects. That’s sure to disappoint anyone with dreams of a low-cost HoloLens experience. Acer’s headset is affordable, and it can sense that outside world, but we didn’t see any potential for interaction with reality. We’re inclined to overlook that. The headset’s inside-out tracking is impressive, and its price should be low. Still, a headset billing itself as “Mixed Reality” should, you know, do that. Microsoft may be setting itself up for a PR blunder if Acer’s headset proves similar to other Windows Mixed Reality headsets. 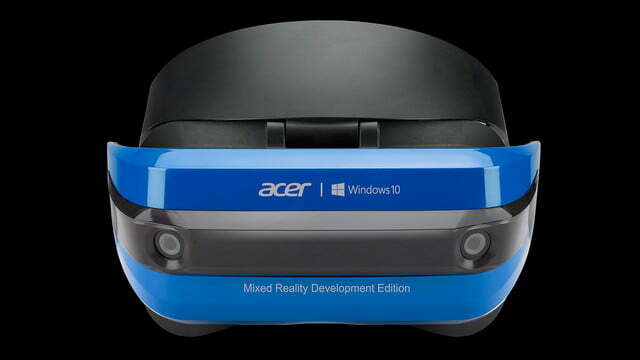 Ultimately, the success of Acer’s Windows Mixed Reality headset will likely depend on its price tag. For now, VR remains an expensive niche. The Oculus starts at $600, and the Vive costs $800. We asked an Acer spokesperson about the headset’s pricing, and they told us it hadn’t been decided. But we’d put our money on the lower end of the pricing spectrum. Greg Sullivan, senior product manager at Microsoft, told Digital Trends that Mixed Reality headsets like Acer’s could ship for as low as $300. Price isn’t the only barrier to adoption. Headsets like Acer’s need a powerful, pricey computer to work properly. However, Sullivan said that might not be the case much longer. Soon, he told Digital Trends, Mixed Reality devices will work on integrated graphics — the graphics chips that ship on off-the-shelf processors from AMD and Intel. 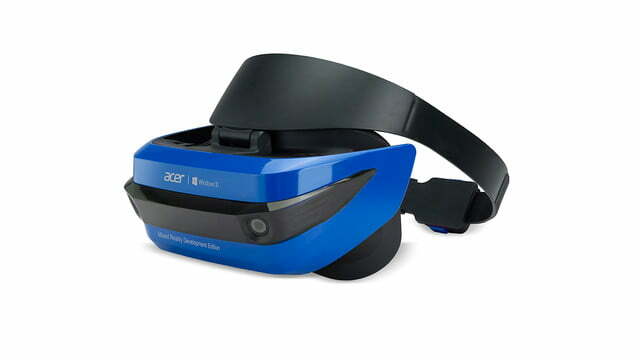 Eliminating those pain points could be key to spurring adoption of Acer headset’s adoption, Sullivan said, along with adoption of Microsoft’s broader Mixed Reality ecosystem. He sees inside-out tracking as something of a silver bullet.